I just wanted to let you know I enjoyed my time in Cambodia, as well as the cycling trip. I really enjoyed Pang (don’t know how to spell his name) our cycling guide, and our driver (we called him Mr. A). Cambodia has some beautiful scenery, I loved the temples, had fun on the beaches, and have never seen so many friendly, smiling people as the Cambodians. Pang spoke English well and was really friendly and accommodating. I’ll write more later, but I didn’t want too much time to pass before I sent my thanks. We had a wonderful time in Myanmar with your company. The guide was excellent- a lot of fun, very knowledgeable and flexible to our needs. We didn’t really enjoy the night in the mountain resort but overall we thought the routes were good. One of our friends, Emma Hayes has booked with you around Mandalay I think. I have told her about our trip so she is very much looking forward to her own! We had a fantastic cycling trip. This was my third cycling trip through S/E Asia and by far the most challenging riding. 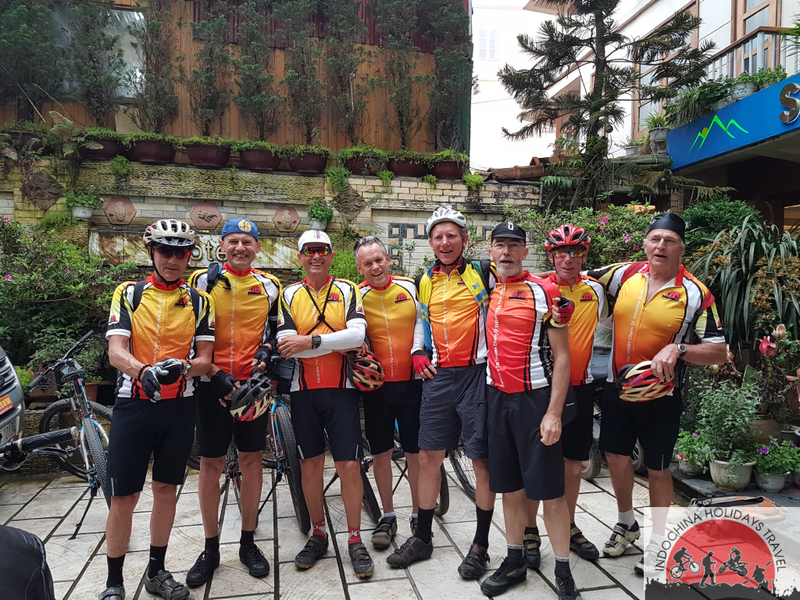 We learn that northern Laos and Northern Vietnam has mountains, that both countries are very different but both great , that all the friendly people along the way add to the fantastic trip, that “a little bit up” can be quite an understatement and finally that your guides love their jobs and love cycling. The highlights must have been staying at the Kingfisher Eco Lodge and watching the elephants from your own bungalow balcony, and The sense of achievement at the end of every great days riding. Northern Laos – Chen is a real gem. she was fun to be with, quick to pick up on the Aussie sense of humor and she’s not bad on a bike. I’m not sure who got more stares from the villagers, the westerners riding bikes or the girl riding along looking after them. She looked after us well, organized a doctor when needed and always made sure we were safe and had plenty of food and drink. Tanja our driver was also very good. And in Cambodia it was great for me to meet up with Samban again. He is a wonderful person, and again looked after us wonderfully well. His genuine honesty meant we learn so much from him about everyday life in Cambodia. I think the balance of the itinerary from the beautiful mountains in northern Laos ,Vietnam to the flatter south along the Mekong and 4 thousand Islands, Cambodia’s less travelled Mondulkiri Provence and finishing in Seam Reap is challenging but great.